Black carbon, or soot, although it is not a gas, can also be caused by unsustainable land use, behave like a greenhouse gas, and contribute to climate change. Carbon dioxide, CO2, is a natural part of the carbon cycle, but human land uses often add more, especially from habitat destruction and the cultivation of soil. When we turn woodlands, wetlands, and other natural habitats into pasture, arable fields, buildings and roads, or when we plough or dig the soil, the carbon held in the soil and vegetation becomes extra carbon dioxide and methane to trap more heat in the atmosphere. driving long distances to visit gardens or to buy garden products. Methane, CH4, is also a natural part of the carbon cycle, but human land uses often add more, especially from anaerobic soil, artificial wetlands such as rice fields, and from the guts of farm animals, especially ruminants such as cattle and sheep. creating homemade liquid feed by putting the leaves of plants such as comfrey underwater, or killing pernicious weeds by covering them with water, with the unintended consequence that the plants may release methane as they decay. Nitrous oxide, N2O, is a natural part of the nitrogen cycle, but human land uses often add more. using synthetic nitrogen fertilizer, for example ‘weed and feed’ on lawns, or even organic manures that are rich in nitrogen such as farmyard manure, especially when plants are not actively growing, so that some of that fertilizer may be oxidized to nitrous oxide. Black carbon is not a gas, but it acts like one, because it can be suspended in the atmosphere and absorb heat. 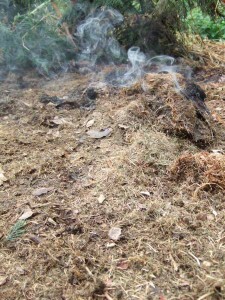 making large heaps of soft compostable material such as grass cuttings which then catch fire. Many of us have pyromaniac tendencies, but if we want to protect the climate we need to cut down on our bonfire habit, because burning garden prunings and weeds, especially if they’re wet, will turn them into soot as well as carbon dioxide. And of course if we buy anything transported by diesel-powered lorries then there will be black carbon emissions from the exhaust. For anybody who wants to find out more, there’s excellent information on land use and climate change in Britain available from Farming Futures. On a worldwide scale, the Worldwatch document ‘Mitigating climate change through food and land use‘ is good on both good and bad farming.